Two new foodie beauty stories out this month. 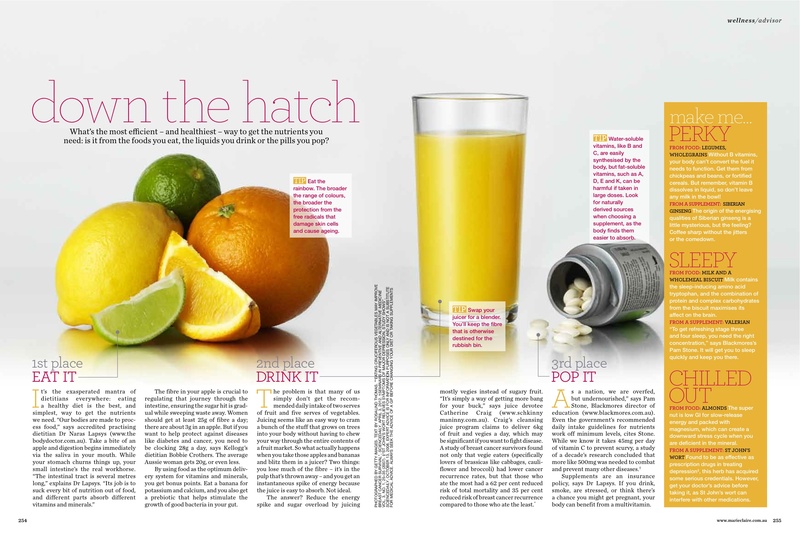 Ever wondered what’s actually better for you, a glass of OJ or a Vitamin C capsule? Find out in Down the Hatch, published in this month’s Marie Claire (PS, the answer is kinda obvious but there is definitely a case for vitamin supplements IMO). And fancy some DIY spa action, straight from your fridge? Or wondering what the hell they’re throwing in moisturiser these days? That’d be Good Enough to Eat, in Weight Watchers mag. As usual, the two stories introduced me to some lurrverly new brands that I’d happily recommend to you. The first is Sharon McGlinchey’s brand MV. Sharon is one of those “beauty editor’s secrets” – she’s a cult facialist who keeps the beauty girls beautiful. Until now I hadn’t tried any of her organic products. I still get disappointed by icky textures and funny smells and general ineffectiveness when I test organic. Not this stuff. These products are HEAVEN. HEAVEN. I’m using the Energizing 9-Oil Cleanser and the Oxygen Formula Moisturiser. Both most, most excellent and nourishing and effective and a joy to use. Next up in Like Giants’ Beauty Awards for this month is Miessence, another organic brand developed by clever Aussie, Narelle Chenery. After 30 minutes on the phone, Narelle had me convinced of this whole alkaline diet hoopla. Go juice some kale, people. Or if that sounds disgusting, take Narelle’s DeepGreen Superfood supplement. It’s yummy (OK it’s palatable) in salad dressing, pumping up pesto or just stir it into some water, throw it down and be done with it. There, are you feeling healthy? You can thank me when you’re 80, have both your original hip joints and the skin of a 73 year old. I greedily open my subscriptions just to see what you’ve been doing this month. Haha. Good reads Mrs. That MV brand sounds lush.